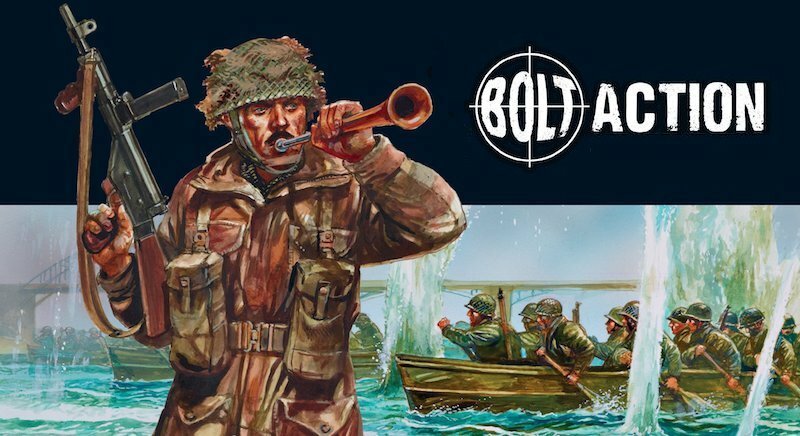 Previously, I did a quick review of Bolt Action: The Alternative History of Campaign – Sea Lion on Bell of Lost Souls. One of my readers from that article asked for more Bolt Action content. I am going to quickly review Bolt Action: Campaign: Market Garden. This is the “Coles Notes” version of the review. For a full review, come on over to Must Contain Minis and check it out. A 4-player game of Bolt Action: Market Garden in play. Photo by Barnaby Ore of the Hamilton Tabletop Gaming Society. Table by Dave Lamers and sponsored by Crucible Crush. Photo used with permission by Barnaby Ore and slightly edited by Jacob Stauttener. Campaign: Market Garden brings late war fight through the Netherlands and Germany to Bolt Action. The nations involved in this conflict include Britain, America and Germany. Germany and Great Britain are the key players here, but America is also involved as the airborne. The book includes many special rules and focuses strongly on scenarios. There are some pretty cool rules in here including modifications that give rifles and LMGs unlimited range across the table in small patrol based games. 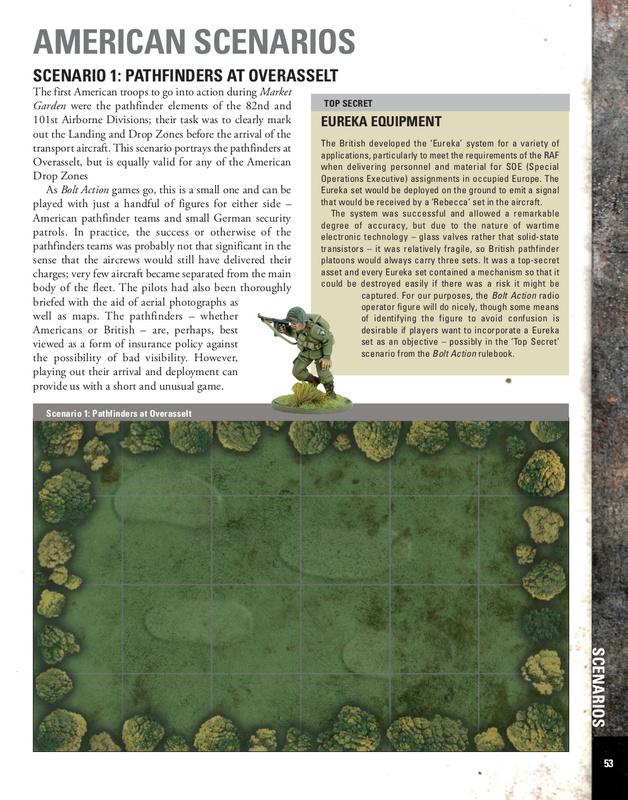 Below is a sample of more rules from Market Garden. 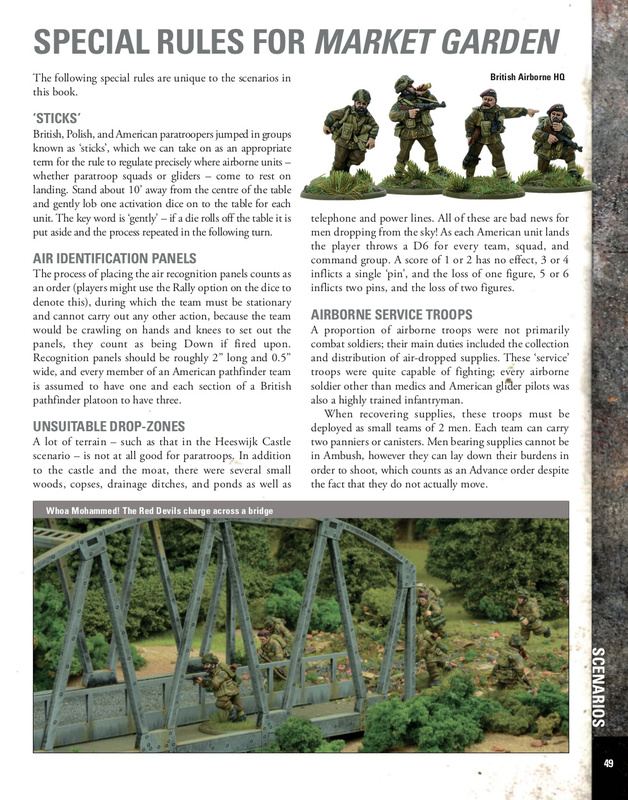 A sample page of the special rules in Market Garden. Image used with permission from Osprey Games. Personally, I am not too sure about lobbing dice onto my nicely painted miniatures and terrain (see the ‘Sticks’ rule), but my feeling is you can pick and choose the rules you want to use with your opponent before play. One of the things that I noticed through out the book is that the forces for each mission are normally dictated to you. For some people, this is a bonus as it really gets into setting up a narrative and makes for a great campaign. Personally, I prefer being allowed to build my own forces rather than taking an assigned list. That said, the author does a great job setting up each scenario. 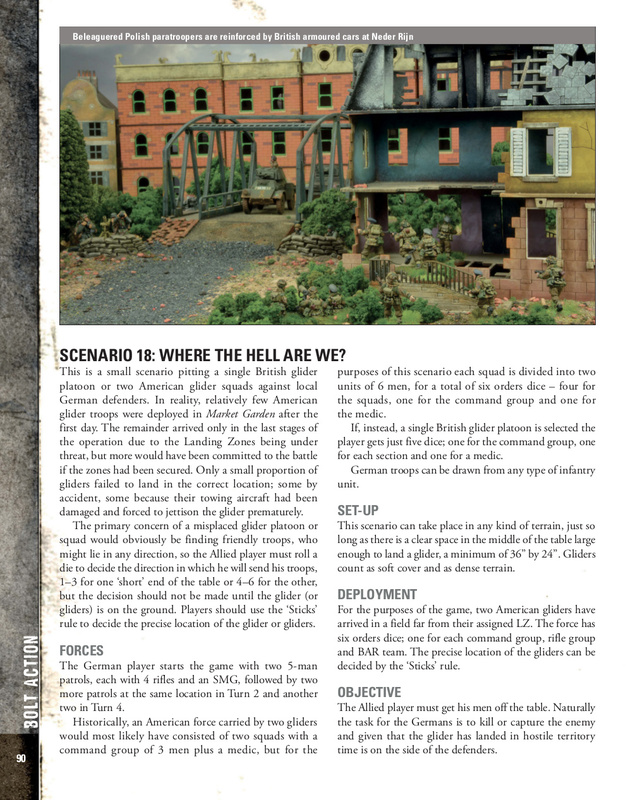 Below are a couple of examples of the scenario pages. A sample page from the first scenario in the book. Image used with permission from Osprey Games. In total, there are 26 missions (scenarios) for you and your friends to work your way through the book. Not bad at all. Below is another example of one of the scenarios in the book. Another sample page of the missions in Bolt Action. Image used with permission from Osprey Games. As you can see, even in scenario 18, the author is suggesting to readers exactly what models to take for the mission. If this is your thing, you will really like this book. If not, the book still offers some really cool lists that you can take from, so I would imagine that you could just house-rule a points limit for each scenario. Overall, this is a good book. While I have some criticisms of the book, I know others will see my criticisms as benefits towards Campaign: Market Garden. One of the questions I always like to answer though is who this book might interest. This book would likely most interest people wanting to play out the Market Garden Campaign. It will also interest people that like small patrol type missions and people that like narrative campaigns with suggested forces. If you fall into any of the above three categories. I recommend the book to you. An interesting side note for the “Power Gamer” is that this book includes lists where you can take two Sherman tanks or where American Airborne units can take a free British Forward Observer (but lose access to a few units the airborne would have in other lists). If your Tournament organizers let you select from any book, there might be some lists you could take advantage of in this book. For non-power gamers, I want to point out that the campaign books are balanced for the campaign within the books. It is not expected that you will take a list from Market Garden to the war in Africa. 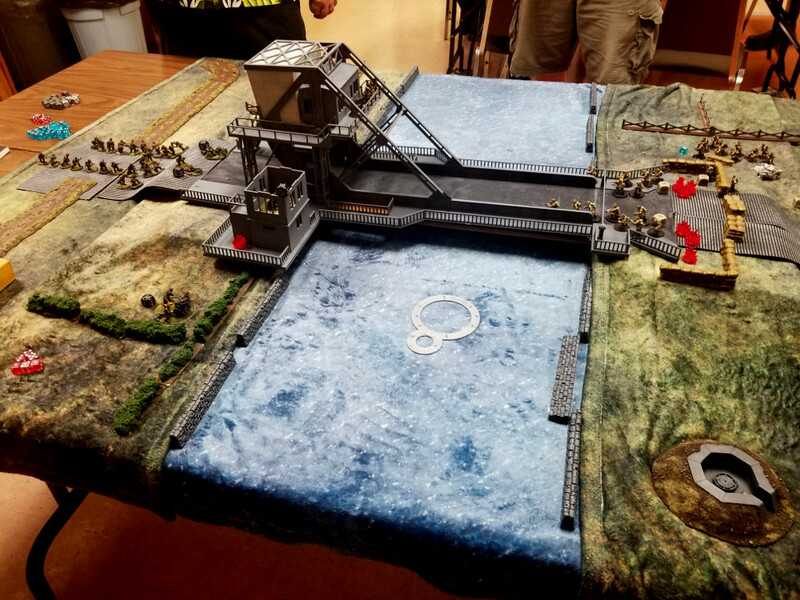 Most tournament organizers I know limit army selection to a few specific books (or to just the core rule book) for their events – but not all tournament organizers are the same. Hopefully you enjoyed this quick review of Bolt Action: Campaign: Market Garden. If you would like to see a fuller review, check out our deeper review on Must Contain Minis. Also, if you like my content, please check out my accounts on Facebook, Twitter and Instagram.